Footage inside home as Canada fire spreads Jump to media player A Canadian family from near Fort McMurray have relived the moment that wildfires tore through their home. Canada fire emergency declared Jump to media player Wildfire forces 80,000 residents to be moved from an area in the Canadian province of Alberta. Dramatic fire tornado in Canada Jump to media player Footage posted to social media shows a brush fire developing into a fire tornado within seconds. CCTV shows fire lantern landing Jump to media player CCTV footage showing a Chinese lantern landing at a recycling plant in the West Midlands before a huge fire started has been released. 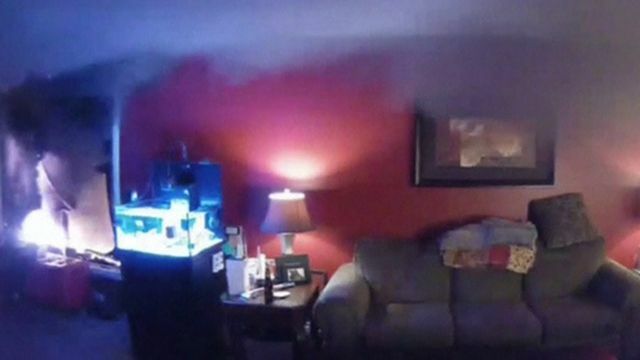 A Canadian man from near Fort McMurray watched fire rip through his house via a home security camera, connected to a smartphone app. James O'Reilly and his family had fled just 20 minutes earlier.